Seed dispersal mutualisms with scatter-hoarders play a crucial role in population dynamics of temperate large-seeded trees. These behaviors shape seed dispersal patterns, which can be applied to conservation of populations, communities, and even ecosystems dominated by large-seeded trees. We draw on a growing body of literature to describe the ecological context and consequences of scatter-hoarding as a seed dispersal mechanism. We synthesize the quantitative literature on the interaction between members of the avian family Corvidae (crows, ravens, jays, magpies, and nutcrackers) and nut-bearing trees such as pines (Pinus spp.) and oaks (Quercus spp.) to examine unique aspects of avian scatter-hoarders as seed dispersers. During the scatter-hoarding process, seed selectivity, transportation distance, hoarding frequency, and cache placement affect seed dispersal effectiveness, a measure of the quantity and quality of dispersal. Case studies from around the world highlight the role of corvid seed dispersal in population dynamics of trees, and how the birds' scatter-hoarding behavior can be facilitated for the restoration of oak- and pine-dominated habitats. This mutualism, which provides many plant species with long-distance, high-quality seed dispersal, will likely become even more important for conservation of oak and pine ecosystems as suitable climates shift rapidly in the decades ahead. This ecosystem service provided by corvids could therefore serve as an efficient conservation tool. Breeding productivity frequently shows variation across a species' range or locally between different habitat types. Agricultural transformation generally has negative effects on biodiversity and often results in reduced prey abundance or increased foraging effort in top predators and, consequently, often reduces breeding productivity. Major factors that affect reproductive success also include climatic variables, breeding density, and timing of breeding. We explored the influence of agricultural transformation on a specialist raptor, Verreaux's Eagle (Aquila verreauxii). From 2011 to 2014, we examined productivity in 2 adjacent populations in the Western Cape Province, South Africa: an unspoiled area of Fynbos vegetation with little human development (the Cederberg Mountains) and an agriculturally transformed area (the Sandveld region). Counterintuitively, breeding productivity was higher in the agricultural than in the natural site. In particular, the proportion of pairs that attempted to breed (i.e. breeding rate) was higher in the Sandveld (0.94 ± 0.07 attempts pair−1 yr−1) than in the Cederberg (0.48 ± 0.14 attempts pair−1 yr−1). Nesting success was also higher in the Sandveld (0.80 ± 0.05 fledged young attempt−1 yr−1) than in the Cederberg (0.57 ± 0.13 fledged young attempt−1 yr−1), and the probability of nesting successfully was related to the lay date (decreased success with later laying) and to the total cumulative rainfall up to 28 days after hatching (decreased success with increasing rainfall). Using the site-specific breeding rates to produce a population model, we found that in isolation, the Cederberg population is unlikely to be self-sustaining, but Verreaux's Eagles breeding in the agriculturally developed Sandveld region are likely to be an important source population, despite occurring at a much lower density. These results, contrary to our expectations, suggest that Verreaux's Eagle may be more adaptable to agricultural transformation than previously thought, with breeding performance in the agricultural site adequate to maintain the population. The Black Curassow (Crax alector) is a large game bird with Vulnerable conservation status found in north-central South America. We examined its distributional pattern across French Guiana using a large number of environmental descriptors at 3 scales of analysis: landscape, forest type, and microhabitat. We used a hierarchical model with temporary emigration and imperfect detection for data collected by standard distance sampling methods at 35 study sites. At the landscape scale, Black Curassow density decreased with hunting pressure and increased with steeper slopes in both hunted and unhunted areas. Topography appeared to be a good proxy for Black Curassow ecological requirements and probably reflected habitat quality. At the forest scale, population density was negatively correlated with the abundance of palms and Mimosoideae and positively correlated with the abundance of Lauraceae. Botanical families did not directly influence Black Curassow distribution, but rather determined spatial patterns by being markers of a particular forest type. At the microhabitat scale, Black Curassows used hilltops more frequently than other parts of the local topographical gradient. Our multiscale analysis shows that this species' distribution can be explained by biotic or abiotic conditions, regardless of the scale. For conservation, we recommend maintaining connectivity between Black Curassow populations separated by hunted areas. Our predicted densities could be used to adapt hunting quotas across French Guiana's forests. We show that combining field and remote sensing data helps to understand the ecological processes responsible for Black Curassow habitat relationships. Tidal marsh loss to anthropogenic environmental impacts and climate change, particularly sea level rise, has and will continue to cause declines in tidal marsh bird populations. Distribution patterns of tidal marsh birds are generally known, yet we lack detailed knowledge of local abundance and regional population sizes, which limits our ability to develop effective conservation strategies that will mitigate the impacts of marsh loss. We designed and implemented a probabilistic sampling framework to establish a regional marsh bird monitoring program, and collected baseline information for breeding tidal marsh birds in the northeastern USA (Maine to Virginia). We sampled 1,780 locations in 2011–2012 to provide regional population estimates for 5 tidal marsh–specialist birds. We estimated that there were 151,000 Clapper Rails (Rallus crepitans; 95% CI = 90,000–212,000), 117,000 Willets (Tringa semipalmata; 95% CI = 88,000–146,000), 5,000 Nelson's Sparrows (Ammodramus nelsoni; 95% CI = 1,000–9,000), 53,000 Saltmarsh Sparrows (A. caudacutus; 95% CI = 37,000–69,000), and 230,000 Seaside Sparrows (A. maritimus; 95% CI = 174,000–286,000) in northeastern tidal marshes. Our baseline assessment can be used to identify local habitat patches important to regional populations for each species and to prioritize conservation actions in targeted areas to maximize tidal marsh bird persistence. The flexibility and probabilistic design of our sampling framework also allow for integration with other monitoring programs (e.g., the U.S. Fish and Wildlife Service Salt Marsh Integrity Program and National Park Service Vital Signs Monitoring Program) so that inferences for these species can be made at multiple spatial scales. Zink (2015) argued there was no evidence for genetic, morphological, or ecological differentiation between the federally endangered Southwestern Willow Flycatcher (Empidonax traillii extimus) and other Willow Flycatcher subspecies. Using the same data, we show there is a step-cline in both the frequency of a mtDNA haplotype and in plumage variation roughly concordant with the currently recognized boundary between E. t. extimus and E. t adastus, the subspecies with which it shares the longest common boundary. The geographical pattern of plumage variation is also concordant with previous song analyses differentiating those 2 subspecies and identified birds in one low-latitude, high-elevation site in Arizona as the northern subspecies. We also demonstrate that the ecological niche modeling approach used by Zink yields the same result whether applied to the 2 flycatcher subspecies or to 2 unrelated species, E. t. extimus and Yellow Warbler (Setophaga petechia). As a result, any interpretation of those results as evidence for lack of ecological niche differentiation among Willow Flycatcher subspecies would also indicate no differentiation among recognized species and would therefore be an inappropriate standard for delineating subspecies. We agree that many analytical techniques now available to examine genetic, morphological, and ecological differentiation would improve our understanding of the distinctness (or lack thereof) of Willow Flycatcher subspecies, but we argue that currently available evidence supports protection of the Southwestern Willow Flycatcher under the Endangered Species Act. The Puerto Rican Plain Pigeon (Patagioenas inornata wetmorei) and the White-crowned Pigeon (P. leucocephala) are hunted illegally in Puerto Rico, despite being protected. Data are lacking to estimate how many are hunted illegally each year. For this reason, we used abundance estimates derived from distance sampling surveys conducted in 1986–2014 to (1) fit a Bayesian state-space model, (2) estimate posterior distributions for population and harvest management parameters (e.g., growth rate, carrying capacity, and maximum sustainable harvest rate), and (3) predict abundance in 2025 as a function of potential illegal hunting in 2015–2024. For the Plain Pigeon and White-crowned Pigeon, respectively, the intrinsic rate of population growth was 0.351 (95% credible interval = 0.086–0.737) and 0.352 (0.094–0.699), population carrying capacity was 55,840 (29,649–96,505) and 73,692 (47,225–98,434) individuals, maximum sustainable harvest rate was 0.176 (0.043–0.369 and 0.047–0.349), and predicted abundance was 20,536 (8,167–89,040) and 29,361 (1,779–100,937) individuals in 2025. Both pigeon populations increased from low numbers in the 1980–1990s, recovered quickly after hurricanes in 1989 and 1998, surpassed carrying capacity in 1995–2008, and decreased sharply at the same time that legal hunting of columbids increased in 2008–2014. Our monitoring and modeling results suggest that an increase in illegal hunting may be responsible for some of the abundance decline in 2008–2014, and that population sustainability may be affected by illegal hunting in 2015–2025. Therefore, data collection and the control of illegal hunting should be considered management priorities. Because we are updating model-based abundance predictions annually with monitoring data, we can inform management decisions, evaluate the results of conservation actions taken to maintain the pigeon populations fluctuating around carrying-capacity levels, and learn from the comparison of estimated and predicted abundances. Our monitoring and modeling scheme is applicable to other resident and migratory bird populations in the Caribbean. Researchers have long recognized that the spatial distribution of animals relates to habitat requirements. In birds, despite recent advances in tracking techniques, knowledge of habitat needs remains incomplete for most species. Using radio telemetry, we quantified the relative space use of 37 Wood Thrush (Hylocichla mustelina) males, captured over 2 years (2013, 2014) on their breeding grounds in coastal Virginia. Following tracking, we collected data on prey availability (n = 370 plots) and habitat structure (n = 222 plots) within bird home ranges, and modeled bird utilization distribution with both sets of variables using mixed models. Our objectives were to (a) determine the relative importance of habitat structure and prey availability for bird use, (b) identify specific resources that related to bird utilization distribution, (c) test the hypothesis that soil moisture explained prey availability, and (d) evaluate models by determining whether model-identified conditions agreed with data at sites where Wood Thrushes were absent over the preceding 5 years. Of prey variables, high-use areas within bird home ranges were linked to higher biomass of spiders and worm-like invertebrates, which were strongly correlated with soil moisture. 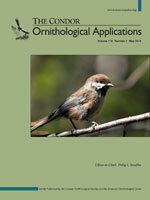 Of habitat structure variables, bird use related negatively to red oak (Quercus spp.) count and pine (Pinus spp.) basal area, and positively to forest canopy height, snag basal area, and number and species richness of trees, among others. Evaluation of 12 covariates in our best model revealed that 5 were significant, with conditions at bird absence sites congruent with our models. Goodness-of-fit tests revealed poor fit of the prey-only model, whereas the habitat-only model explained nearly 8 times the variation in bird use. The model utilizing both prey and structure covariates yielded only marginal improvement over the habitat-only model. Consequently, management objectives aimed at habitat improvement for the declining Wood Thrush should particularly consider habitat structure resources. Improving the efficiency of monitoring protocols prescribed by conservation plans can release typically limited funding for other management and conservation activities. We present an approach for optimizing protocols that considers the precision of parameter estimates, costs of implementation, and broader monitoring-program goals. In a case study of the Coastal California Gnatcatcher (Polioptila californica californica), we compared the efficiency of point-count surveys (with and without playbacks of vocalizations) and area-search surveys (with playbacks) for estimating site occupancy. Conducting an area-search survey of a 2.25 ha plot required an average of 19 min longer than conducting an 18-min point-count survey (15 min of silent observation followed by 3 min of playbacks) at the same location. However, the estimated detection probability (p) during a single visit was lower for point counts (0.41 ± 0.05) than for area searches (0.69 ± 0.05), while both methods generated similar occupancy (Ψ) estimates (0.34 ± 0.06). To obtain the specified level of precision for estimates of occupancy (i.e. with 10% coefficient of variation), the total survey effort (travel time + survey time) was projected to be 35% lower for area searches than for point counts because of differences in detection probability and, thus, in the required numbers of sites and visits per site. For point counts, detection probability increased from 0.35 ± 0.02 to 0.46 ± 0.03 visit−1 after playbacks were broadcast at the end of the count. Free use of playbacks is one of the factors that contributed to the higher detection probability of the area-search method, but playbacks may introduce a slight positive bias into occupancy estimates. Because there are tradeoffs in switching to area-search methods, the decision to switch protocols demands full consideration of monitoring-program goals and the costs and benefits of each survey approach. Anthropogenic modifications to the natural environment have profound effects on wild animals, through structural changes to natural ecosystems as well as anthropogenic disturbances such as light and noise. For animals that migrate nocturnally, anthropogenic light can interfere with migration routes, flight altitudes, and social activities that accompany migration, such as acoustic communication. We investigated the effect of anthropogenic light on nocturnal migration of birds through the Great Lakes ecosystem. Specifically, we recorded the vocal activity of migrating birds and compared the number of nocturnal flight calls produced above rural areas with ground-level artificial lights compared to nearby areas without lights. We show that more nocturnal flight calls are detected over artificially lit areas. The median number of nocturnal flight calls recorded at sites with artificial lights (31 per night, interquartile range: 15–135) was 3 times higher than at nearby sites without artificial lights (11 per night, interquartile range: 4–39). By contrast, the number of species detected at lit and unlit sites did not differ significantly (artificially lit sites: 6.5 per night, interquartile range: 5.0–8.8; unlit sites: 4.5 per night, interquartile range: 2.0–7.0). We conclude that artificial lighting changes the behavior of nocturnally migrating birds. The increased detections could be a result of ground-level light sources altering bird behavior during migration. For example, birds might have changed their migratory route to pass over lit areas, flown at lower altitudes over lit areas, increased their calling rate over lit areas, or remained longer over lit areas. Our results for ground-level lights correspond to previous findings demonstrating that migratory birds are influenced by lights on tall structures. Conversion of tropical forests and diverse multicrop agricultural land to commercial monocultures is a conservation concern worldwide. In northeast India, landscapes under shifting agriculture (or jhum) practiced by tribal communities are increasingly being replaced by monoculture plantations (e.g., teak, oil palm). We compared oil palm and teak plantations, shifting agricultural fields, and forest fallows (0–8 yr regeneration) with tropical rainforest edge and interior sites in Dampa Tiger Reserve, Mizoram, India. Twenty replicate transects were surveyed in each of the 5 study strata for vegetation structure, bird species richness and density, bird abundance, and species composition. Tree density and canopy and vertical structure were lowest in oil palm plantations, intermediate in teak plantations and jhum, and highest in rainforest sites. Tree density in jhum (4.3 stems per 100 m2) was much higher than in oil palm plantations (0.5 stems per 100 m2), but lower than in rainforest (6.8–8.2 stems per 100 m2), with bamboo absent in oil palm plantations and most abundant in regenerating jhum (25 culms per 50 m2). We recorded 107 bird species (94 forest species, 13 open-country species). Oil palm plantations had the lowest forest bird species richness (10 species), followed by teak plantations (38), while jhum (50) had only slightly lower species richness than the rainforest edge (58) and interior (70). Forest bird abundance in the jhum landscape was similar to that in rainforest, on average 304% higher than in oil palm plantations, and 87% higher than in teak plantations. Jhum sites were more similar in bird community composition to rainforest than were monocultures. Rapid recovery of dense and diverse secondary bamboo forests during fallow periods makes the shifting agricultural landscape mosaic a better form of land use for bird conservation than monocultures. Land use policy and conservation plans should provide greater support for shifting agriculture, while mandating better land use practices such as retention of forest remnants, native trees, and riparian vegetation in monoculture plantations. Wind energy is a rapidly expanding industry with potential indirect effects to wildlife populations that are largely unexplored. In 2011 and 2012, we monitored 211 nests of 2 grassland songbirds, Horned Lark (Eremophila alpestris) and McCown's Longspur (Rhynchophanes mccownii), at 3 wind farms and 2 undeveloped reference sites in Wyoming, USA. We evaluated several indices of reproductive investment and success: clutch size, size-adjusted nestling mass, daily nest survival rate, and number of fledglings. We compared reproductive success between wind farms and undeveloped sites and modeled reproductive success within wind farms as a function of wind energy infrastructure and habitat. Size-adjusted nestling mass of Horned Lark was weakly negatively related to turbine density. In 2011, nest survival of Horned Lark decreased 55% as turbine density increased from 10 to 39 within 2 km of the nest. In 2012, however, nest survival of Horned Lark was best predicted by the combination of vegetation height, distance to shrub edge, and turbine density, with survival increasing weakly with increasing vegetation height. McCown's Longspur nest survival was weakly positively related to vegetation density at the nest site when considered with the amount of grassland habitat in the neighborhood and turbine density within 1 km of the nest. Habitat and distance to infrastructure did not explain clutch size or number of fledglings for either species, or size-adjusted nestling mass for McCown's Longspur. Our results suggest that the influence of wind energy infrastructure varies temporally and by species, even among species using similar habitats. Turbine density was repeatedly the most informative measure of wind energy development. Turbine density could influence wildlife responses to wind energy production and may become increasingly important to consider as development continues in areas with high-quality wind resources. Responses of boreal birds to changes in forest structure and composition caused by construction of well pads, seismic lines, and pipelines are poorly understood. Bird species associated with older forests are predicted to experience larger population declines with increased disturbance compared with species associated with younger or open habitats; however, point count methods may influence apparent outcomes because the proportional area of disturbed vegetation and the magnitude, uncertainty, and detection of a disturbance response by birds vary as a function of sampling area. We analyzed point count data from 12 energy sector studies and measured how disturbance type and point count radius interacted to affect 531 impact ratios (mean abundance at point counts centered within disturbances relative to abundance at point counts within forest 150–400 m from the nearest edge bordering those disturbances [59 species*3 disturbance types*3 point count radii]). We observed larger disturbance effects (impact ratios) within larger-radius point counts at well pads (100-m and unlimited-distance) and pipelines (unlimited-distance) compared with 50-m point counts at seismic lines, and within 50-m point counts at well pads relative to 50-m point counts at seismic lines. Effect uncertainty was higher at well pads and pipelines than seismic lines, and lower within larger-radius point counts. The probability of detecting a disturbance response was greater for larger-radius point counts at pipelines than for 50-m point counts at seismic lines, and within 50-m point counts at well pads relative to 50-m point counts at seismic lines. On average, a species was more likely to increase in abundance near an energy sector disturbance if the species was not associated with older (>75 yr) forest stages. While the effects of disturbance varied by species and with disturbance type, the effects of pipelines and seismic lines were better detected by larger-radius point counts, while the effects of well pads were better detected by smaller-radius point counts. Numerous wind energy projects have been constructed in the central and southern Great Plains, USA, the main wintering area for midcontinental Sandhill Cranes (Grus canadensis). In an initial assessment of the potential risks of wind towers to cranes, we estimated spatial overlap, investigated potential avoidance behavior, and determined the habitat associations of cranes. We used data from cranes marked with platform transmitting terminals (PTTs) with and without global positioning system (GPS) capabilities. We estimated the wintering distributions of PTT-marked cranes prior to the construction of wind towers, which we compared with current tower locations. Based on this analysis, we found 7% spatial overlap between the distributions of cranes and towers. When we looked at individually marked cranes, we found that 52% would have occurred within 10 km of a tower at some point during winter. Using data from cranes marked after tower construction, we found a potential indication of avoidance behavior, whereby GPS-marked cranes generally used areas slightly more distant from existing wind towers than would be expected by chance. Results from a habitat selection model suggested that distances between crane locations and towers may have been driven more by habitat selection than by avoidance, as most wind towers were constructed in locations not often selected by wintering cranes. Our findings of modest regional overlap and that few towers have been placed in preferred crane habitat suggest that the current distribution of wind towers may be of low risk to the continued persistence of wintering midcontinental Sandhill Cranes in the central and southern Great Plains. Avian collisions with overhead power lines are of conservation concern, particularly in migration corridors. We studied potential collisions where an existing power line supported by towers 20–25 m tall was replaced by the Susquehanna-Roseland line (S-R line), a new line with towers 55–60 m tall. The S-R line crosses Kittatinny Ridge, a corridor for raptors migrating south through New Jersey and Pennsylvania, USA. We hypothesized that the S-R line, which on Kittatinny Ridge includes markers designed to increase its visibility to birds, would cause migrating raptors to react in 1 of 3 ways: (1) to not alter flight elevation, but to pass safely through the S-R wire zone; (2) to not alter flight elevation, and to not pass safely through the wire zone, leading to collisions; or (3) to alter flight elevation and to pass safely above or below the S-R wire zone. To evaluate these hypotheses, we recorded the flight elevations of migrating raptors in 2013 before construction of the S-R line and in 2014 postconstruction. 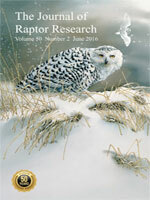 Preconstruction, we recorded 3,698 raptor crossings. Most raptors (72%) crossed above the anticipated S-R wire zone. Some (24%) passed through the anticipated S-R wire zone, and a few (4%) passed below the anticipated S-R wire zone. Postconstruction, we recorded 4,482 crossings. Most raptors (92%) crossed above the S-R wire zone. A few passed through (5%) or below (3%) the S-R wire zone. Postconstruction, raptors responded to the new line by flying higher than they had when traversing the previous line. We did not observe any collisions. Altered flight elevations and the absence of observed collisions supported hypothesis 3. If similar patterns occur at other lines that cross diurnal migration corridors along ridges, then future monitoring may be better focused on potentially riskier settings, such as areas where migrating birds do not have deflected winds to assist with gaining elevation. Energy infrastructure is widespread worldwide. Renewable energy technologies, which are expanding their footprint on the landscape and their contribution to energy availability, represent a different kind of infrastructure from extractive energy technologies. Although renewable energy sources may offer a ‘greener alternative' to traditional extractive energy sources, mounting evidence suggests that renewable energy infrastructure, and the transmission lines needed to convey energy from renewable energy facilities to users, may impact birds. Peer-reviewed literature historically has focused on the direct effects of electrocution and, to a lesser extent, collisions with overhead power systems, and on avian collisions at wind energy facilities, with less consideration of indirect effects or other energy sectors. Here, we review studies that have examined direct and indirect effects on birds at utility-scale onshore wind- and solar-energy facilities, including their associated transmission lines. Although both direct and indirect effects appear site-, species-, and infrastructure-specific, generalities across energy sectors are apparent. For example, large-bodied species with high wing loading and relatively low maneuverability appear to be especially susceptible to direct effects of tall structures, and the risk of collision is likely greater when structures are placed perpendicular to flight paths or in areas of high use. Given that all infrastructure types result in direct loss or fragmentation of habitat and may affect the distribution of predators, indirect effects mediated by these mechanisms may be pervasive across energy facilities. When considered together, the direct and indirect effects of renewable energy facilities, and the transmission lines serving these facilities, are likely cumulative. Ultimately, cross-facility and cross-taxon meta-analyses will be necessary to fully understand the cumulative impacts of energy infrastructure on birds. Siting these facilities in a way that minimizes avian impacts will require an expanded understanding of how birds perceive facilities and the mechanisms underlying direct and indirect effects. Continued global expansion in the development of energy and its associated infrastructure is expected in the coming decades. Substantial concern exists about the impacts of this energy infrastructure on bird populations. In this special section, Smith and Dwyer (2016) provide a timely review of interactions between birds and renewable energy infrastructure, and several studies address avian interactions with renewable and nonrenewable energy infrastructure. I briefly summarize these studies and place avian interactions with energy infrastructure in the context of the many anthropogenic threats to birds. There is vast variation in the amount of mortality caused by different man-made threats. Comparing threats in the context of energy development is useful for attracting public, scientific, and policy attention, for highlighting major research gaps, for providing scientific evidence to inform resource allocation decisions, and for developing mitigation strategies whereby mortality risk from one threat can be offset by reducing risk from another threat. However, broad comparisons of mortality should not be used on their own to draw conclusions about population-level impacts, to conclude that low mortality or a paucity of information negates biologically significant impacts or obviates a need for action, or to develop mortality mitigation strategies when little information exists to inform the balancing of risks. To move beyond gross mortality estimates toward comparisons of actual population-level impacts, a balance must be struck between conducting research that produces generalizable results and studies that focus on species, locations, and response variables of interest. Additional information about the many direct and indirect effects of energy infrastructure, such as the research described by the articles in this special section, will be crucial to achieving an optimal tradeoff between energy development and wildlife conservation.